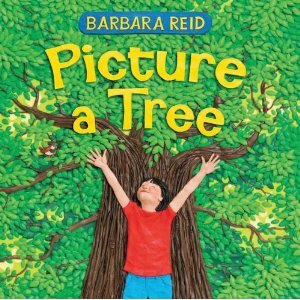 The next picture book nominee for the 2012 Canadian Children's Book Centre Awards that I am reviewing is from Canadian picture book legend Barbara Reid. Barbara Reid has a long history of Canadian picture book successes. Every Canadian picture book bestsellers list I have seen at Quill & Quire has included at least one of her books. Read Me a Book is a personal favourite. The reason Barbara Reid is so loved is because her Plasticine illustrations are so unique and inviting. The textures her plasticine scenes provide add extra dimensions to every single one of her books and this one is no different. A tree seems like a simple thing, and it's one of the first things kids learn to draw. But the trees Reid portrays are more than just a green and brown thing off by itself. She gives us so many different perspectives on trees. These trees are habitats, community members, shades, and mimics of humans. This is the kind of book that is perfect for the new core curriculum standards. It introduces nature, seasons, a child's place in the world and their neighbourhoods, and new ideas about art. We all really enjoyed all the details. Check out this great trailer for the book. This is the thirteenth book I have reviewed for the Sixth Canadian Book Challenge. I grew up adoring her books. I even did two plasticine illustrations in her style back in highschool. We had them framed and on the walls but the glass broke and somehow was never replaced. Thanks for the reintroduction to Barbara Reid. I'm sure my toddler will love her books as much as I did!